This product forms a complex manganese iron phosphate coating on iron and steel. It is also referred to in the industry as PARKERIZING. The coating when finished with a suitable lubricant (Phosphate Dry to Touch Oil) provides good corrosion resistance and reduces wear on moving parts by preventing metal to metal contact. 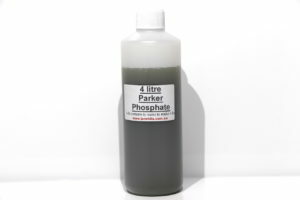 Parker Phosphate is commonly used for engine and other machine components for break-in usage. It is also on other steel and iron surfaces where friction is encountered in the operation of the part. Phosphate Dry to Touch Oil is a self-emulsifying corrosion inhibitor concentrate. It is designed to be used over the Parker Phosphate coating to produce a dry to touch corrosion resistant film. It is non-flammable under operating conditions, highly corrosion resistant and has excellent lubricity. The Parker Phosphate electrolyte or chemical needs to be at an optimum temperature for successful plating. The temperature is very high and needs to be maintained carefully. The ideal temperature is between 95 to 98 degrees Celsius. This means you will need to heat your Parker Phosphate chemical. The best way to achieve this is placing your chemical into a stainless steel container and externally heating it with a naked flame. (small gas portable camping stove is ideal). The temperature must be kept within this range with an accurate thermometer. 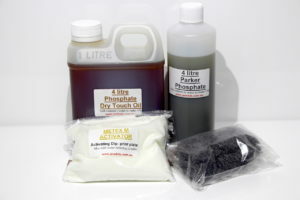 The Phosphate Dry to Touch Oil electrolyte or chemical needs to be at an optimum temperature for successful finishing. The temperature is high and needs to be maintained carefully. The ideal temperature is between 50 to 60 degrees Celsius. This means you will need to heat your Phosphate Dry to Touch Oil. The best way to achieve this is placing your chemical into a stainless steel container and externally heating it with a naked flame. (small gas portable camping stove is ideal). The temperature must be kept within this range with an accurate thermometer. Parker Phosphate is supplied to you as a 2 part process. 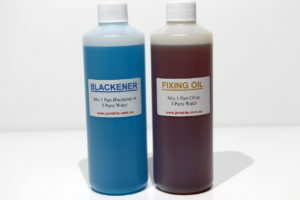 You will receive 2 bottles, one containing the Parker Phosphate and one containing the Phosphate Dry to Touch Oil. Both are liquid concentrates and have various chemicals that are pre mixed. The contents you receive will need to be mixed with water at the ratio specified on the labels. 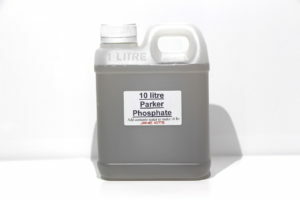 Therefore if you order a 4 litre mix, you will receive a 500 ml bottle of Parker Phosphate, this should be mixed with 3.5 litres of water to make a 4 litre bath. You will also receive a 1 litre Bottle of Phosphate Dry to Touch Oil. This 1 litre bottle of chemicals should be mixed with 3 litres of water to make a separate 4 litre bath. NOTE you must mix all contents with water initially at the correct ratio. Do not partially mix with water to make up smaller quantities. It has to be mixed with de-ionised, demineralised, distilled or clean rain water. Do not use tap Water. Note Before attempting to plate your items first you must activate in METEX M activator. METEX M is an acid salt that is mixed with water at a ratio of 200 gm pre litre. Your parts have to be completely clean prior to this activation and it is a process done prior to the Parker Phosphate coating. After immersion in the Metex M solution a clean water rinse is required. Parker Phosphate is designed to plate directly onto iron and steel. NOTE: Care should be taken by the bath operator no matter what type of bath is being used. Avoid allowing chemicals to remain on your skin for long periods. Safety glasses and clothing that covers arms and legs should also be worn. A well ventilated room is necessary and avoid inhaling fumes that are present during the plating or mixing processes. A suitable respirator is recommended. as the name suggests is a blackening procedure that does not require any electrical current. Jane Kits has a relatively simple and effective method for the room temperature blackening of iron or steel parts. 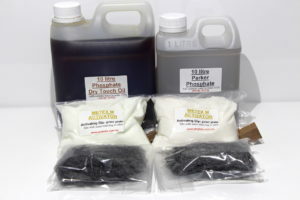 The process is a double-dip method using non-hazardous products at room temperature and there are no fumes. It will chemically blacken cast iron and steels containing 12% chromium or less. The process consists of two separate concentrated chemicals called Blackener and a Fixing Oil. These are both mixed with water and are placed into two separate plating baths or containers. The result will be an even coat of attractive blackening that helps to protect against corrosion. Both of the concentrates are mixed with either deionised, demineralised, distilled or rain water. The ratio is 3 parts water to 1 part Blackening chemical. The best containers to use for the bath are plastic or stainless steel. The blackening chemical must be used at a temperature above 20 degrees Celsius. The ideal temperature range is 20 to 25 degrees Celsius. The item is immersed in the Blackening solution for approximately 1 minute. 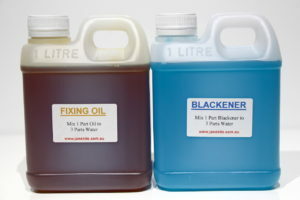 Again the Fixing Oil concentrate is mixed with either deionised, demineralised, distilled or rain water. The ratio is 3 parts water to 1 part Fixing Oil chemical. The best containers to use for the bath are plastic or stainless steel. 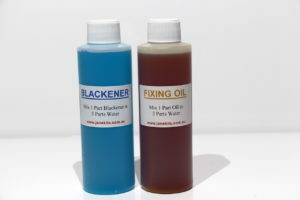 As with the Blackening chemical, it is essential the Fixing Oil chemical be used at a temperature above 20 degrees Celsius. At too low a temperature the oil is thick and lumpy. The ideal temperature range is 20 to 25 degrees Celsius. To accelerate the drying time and improve the quality of the corrosion preventive film, operate the bath at 60 to 70 degrees Celsius. 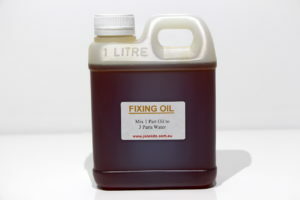 The item is then immersed in the Fixing Oil solution for approx 5 minutes. The contents you receive will be in two separate containers. They will have various chemicals mixed together and the entire contents should be mixed with water at a ratio of 1 part Iron & Steel Blackening to3 parts water and 1 part Fixing Oil to 3 parts water. 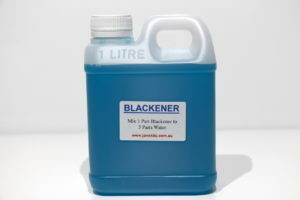 Therefore if you order a 1 litre mix, you will receive a 250 ml bottle of Blackener chemical that should be mixed with 750 ml of water to make a 1 Litre plating bath. You will also receive a 250 ml bottle of FixingOil chemical that should be mixed with 750 ml of water to make a separate 1 litre plating bath. Iron & Steel Blackening will chemically blacken cast iron and steels containing 12% chromium or less.